Good Morning and Happy Memorial Day to everyone. I want to give thanks to our men and women who sacrifice their lives to protect our freedoms, like my own son!! My heart goes out to the families that have lost their loved ones due to their service to our country, such a sacrifice. She is colored in copics and then I used 0.5 Copic multiliner to doodle around her. My papers are from MME "Kate & Co." and "Sky's The Limit"
I used Memory box dies "corner bow" and "precious hearts", one big heart shaped doily for the side, and a strip of gems from Wesbster's Pages for embellishment on the top part of the card. I used tiny word stickers for my message and put them onto another frame sticker from "Kate & Co. collection. The inside, very whimsical and all over the place, kind of how I feel some days! lol. Thank you for stopping by and enjoy the holiday!! This is a beautiful card Kelly. I love the lace, your beautiful coloring and love, love, love the inside. Beautiful design. Beautiful card Kelly, And I love all the details !! The inside of your card is gorgeous too. This is beautiful Kelly. I love the gorgeous image and the colour scheme, embellishments and design are fabulous. Beautifully done Sugar - full of all your pretty do dads - what more could you ask for! Another beauty Kelly! Great doodling around this adorable image. Fantastic coloring too. Good job inside and out! Oh wow, inside, outside, your card is wonderful ! 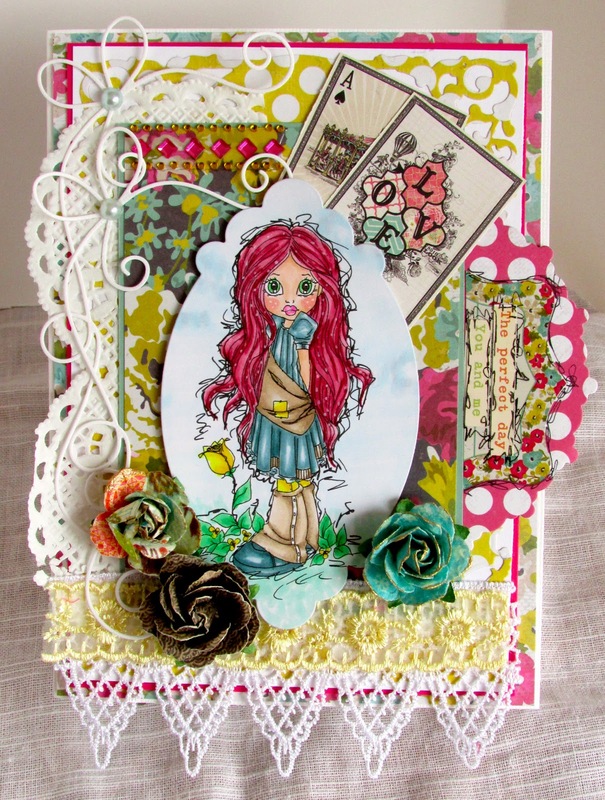 Love the papers, love your wonderful colouring, so fab design for this card ! Gorgeous card! I love how you colored her hair. Wow Kelly this is spectacular with spectacular colors. Your coloring is amazing and you did a wonderfull job on the outside and inside of you card. 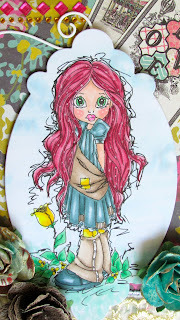 So cute and creatively colored Kelly! FUN! OH, of course I see that MB Corner Bow die! I LOVE that one too! Totally charming card! 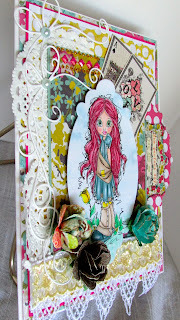 Amazing colouring on the image, Kelly - and a fabulous colour palette overall - what a great card!